Bamboozled October 19, 2017: Is this Amazon job offer a scam? With the holidays fast approaching, many retailers are hiring seasonal workers. Other companies are hopeful for the economy and they’re starting to expand their staffs. Scammers know it, so they try to take advantage of job seekers. Popular companies and job-seekers are often the victim of impersonation scams, in which a con artist pretends to represent a well-known company or brand, using the firm’s good reputation to trick would-be workers into giving up their private information, and worse. But you, as a consumer, need to be smart. Like Jessica Lawrence, a recent college graduate. She lives in the United Kingdom. She received an offer for an interview for a job, but something didn’t sit right with her, so she found Bamboozled’s scam job warnings online. She asked us for advice about the offer, which came from someone who said they were recruiting for Amazon. The recruiter’s email said she found Lawrence on a job search website where Lawrence had indeed posted her resume. Lawrence, who very much wants a job, called Harrington, who told her about a “Marketing Operations Associate” position. Harrington said they would call Lawrence back the next day for a 45-minute phone interview, to be followed by “an assessment day” in London. Lawrence noticed Harrington’s signature at the bottom of the email. It described her as “EU Talent Search Specialist | EU Operations” but it didn’t have any Amazon logos. She said she contacted the job search website, but it was unable to confirm the authenticity of the recruiter. Because we’re always on the lookout for new scams, we were curious. And because Amazon has a presence in New Jersey, we figured this scam, if it was a scam, could come home to our citizens. Lawrence sent us a copy of the email she received from Harrington, and we saw a red flag. A redacted copy of the email sent to Jessica Lawrence by someone who said they recruit for Amazon. Note the email address in the signature is different from the email address at the top. Harrington’s address as written in the signature part of the email was different from the actual address the email came from. One ended with @amazon.com and the other ended with @amazon.co.uk. Both email addresses looked like they could be authentic, but why would the signature email be different from the actual account that sent the message? We decided to do some additional research, sending emails to Amazon and to Harrington herself, though which Harrington email address might work was unknown. 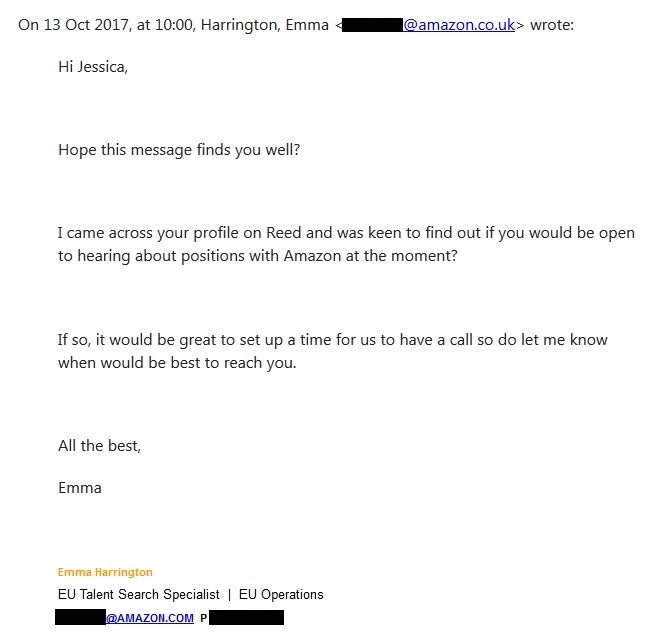 While we waited to hear back, we visited LinkedIn, where we found a U.K.-based Emma Harrington who identified herself as an “EU Talent Search Specialist” for Amazon UK. That was a good sign, but really, anyone can create a LinkedIn account with false information. This person did have more than 500 connections on the site, and she even had a recommendation. Again, a good sign, but not a slam dunk. Then we Googled the job title along with Amazon, and bingo: we found the exact same job listing with the exact same wording on the job section of what appeared to be an Amazon website. We weren’t able to confirm it was legit until shortly before our deadline, when Amazon indeed confirmed the job, but it didn’t share anything about the red flags we pointed out. But the point here is that you can’t assume all job postings are authentic. If you find a listing you like, make sure to do your due diligence before giving someone your private information. First, if you’re emailed about a job, take a look at the sender’s email address and see if it checks out. Next, search online and see if you can find the job posted on a valid website. Then, beware of common job scams such as those that offer positions that require you to receive packages and re-send them, or jobs for which the employer sends you a large check to cover training or job-specific materials. And if the prospective employer asks you to visit a website to fill out an online application, be wary. It could be a phony site created to look like a real application, but then it snatches your Social Security number, birth date and other information. Next, the scammer can use your info for ID theft, such as to file a fake tax return in your name or apply for a loan they will never pay back. Here in New Jersey, Amazon told NJ Advance Media it plans to hire seasonal workers to pick, pack and ship customer orders, but hasn’t said how many yet. You can learn more at amazondelivers.jobs. And a final note here, to Amazon: While Lawrence pulled herself out of the running for the job, you’d be wise to hire her. She was right to be careful here, and she seems to be a pretty smart cookie.